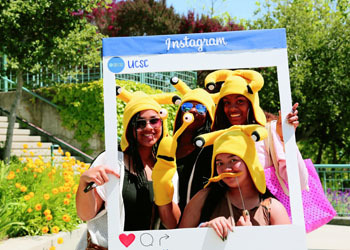 UC Santa Cruz alumni had fun at a Sammy the Slug-themed "photo booth" set up during the weekend. Photo by Carolyn Lagattuta. Alumni Weekend at UC Santa Cruz is a great opportunity to reflect with old friends and meet new ones. Photo by Steve Kurtz. 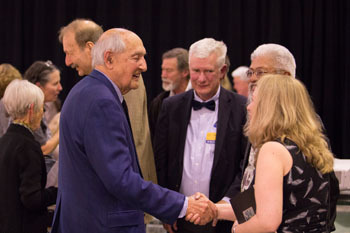 Emeritus professor John Dizikes greeted well-wishers after his keynote remarks. Photo by Steve Kurtz. 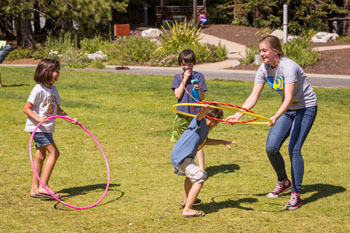 The sons and daughters of UC Santa Cruz Banana Slugs cavorted in the sun at the Banana Slug Kid Zone. Photo by Steve Kurtz. Legendary social psychologist Elliot Aronson reflected on a career that has spanned a half century. Photo by Steve Kurtz. 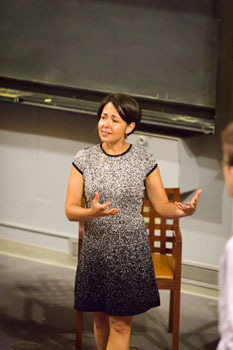 Beth Shapiro lectured about the dubious ethics of mammal cloning. Photo by Steve Kurtz. James Freeman of Blue Bottle Coffee and UCSC philosophy chair and associate professor Daniel Guevara had an eye-opening conversation as part of the True Originals series. Photo by Steve Kurtz. Game designers and UC Santa Cruz graduates Lauren Scott and Akira Thompson had words of wisdom for those who share an interest in their craft. Photo by Steve Kurtz. Hundreds of UC Santa Cruz alumni went back to school last weekend, but without all-night study binges, exams or career counselors standing by. There was no stress, no cramming, just good conversation, selfies with Sammy the Slug, fascinating lectures and reminiscing on green fields overlooking the Monterey Bay. Returning Slugs sat down to an al fresco lunch of mesquite-grilled chicken thighs and kale-chicory-cranberry salad while a vivacious five-part, old-time music group called the Coffee Zombie Collective performed acoustic cover versions of Modest Mouse, Radiohead, Foster the People, Prince, and Sir Mix-a-Lot songs. While most of the action took place on campus, jazz singer Kim Nalley rocked a capacity crowd at Kuumbwa Jazz Center in downtown Santa Cruz after taking part in a presentation about global jazz history as it relates to art and culture, along with UC Santa Cruz Humanities Dean Tyler Stovall, and UC Santa Cruz history professor Eric Porter. In other words, UC Santa Cruz’s Alumni Weekend festivities reflected the eclecticism and adventurous learning that first put this campus on the educational map more than 50 years ago. While the schedule was packed with offerings, there were also quiet moments to admire the natural beauty of the campus while silently stalking towhees, finches, and woodpeckers during a well-attended birding expedition, or think about days gone by while nursing a glass of carrot cake-flavored ale at a wine reception. Herrera’s designated “sit spot” was a lovely old redwood tree, canting at an angle, and heavily pockmarked with a family of woodpecker’s acorn-storage holes. “I used to close my eyes and listen to the sounds all around me,’’ she said. Those times up there on the farm were transformative, and so was Millan’s experience in UC Santa Cruz’s Academic Excellence Program (ACE). 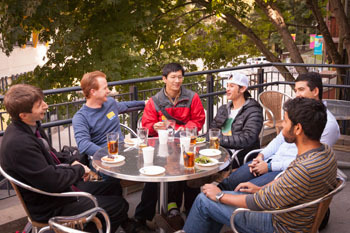 This academic support program is dedicated to increasing the diversity of UCSC students earning bachelors' degrees in science, technology, engineering, and mathematics. That same day, ACE held a ceremony marking 30 years of academic support for STEM students. Revelers had all kinds of opportunities to raise their spirits and stimulate their brains. 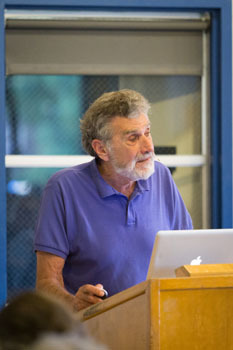 One of the most well-attended events was a “Teach-In” with the legendary social psychologist Elliot Aronson, who reflected on a 55-year career to a more than capacity crowd of attendants, some of them standing outside the lecture hall. Aronson, widely considered one of the most influential and eminent psychologists of the 20th century, is known for his studies of cognitive dissonance, the mental gymnastics that the mind will undertake for the sake of self-justification, whether we’re being hazed in a fraternity or explaining away some messy action that doesn’t fit neatly into the way we view ourselves. While some of Aronson’s work has exposed human foibles, some of his other work has eased racial tensions in schools through a ‘jigsaw classroom’ program and increased political engagement among underrepresented groups. For instance, Aronson spoke of his involvement in the 2012 presidential election. There was concern over Republican efforts to suppress the black vote, and a friend asked him if he could help. The ministers asked members of their congregations to call three friends and “tell them, ‘you are voting, and if I can do it, you can do it.”’ Then they told them to have each of those friends call three friends with the same message. By the way, Aronson has deep roots on campus; he is an emeritus psychology professor here; his four children all attended UCSC. At the same time as Aronson’s lecture, professor Beth Shapiro, who jointly runs the UC Santa Cruz Paleogenomics Lab and teaches in the Physical and Biological Sciences Ecology & Evolutionary Biology Department, delivered a riveting lecture called “How To Clone a Woolly Mammoth,” a cautionary talk regarding the ethical murkiness and scientific improbability of such a venture. Among other things, Shapiro pondered the wisdom of raising a mammoth in captivity in a world that has not yet figured out how to keep elephants happily in captivity. While acknowledging that the reintroduction of mammoths could restore the ecological health of tundras, she said that many non-extinct “super-grazer” animals could do just as good a job at turning the soil over and moving seeds back and forth to reinvigorate those ecosystems. One of the quiet highlights was an intimate discussion between the author Lawrence Weschler (Cowell, ’74) and a much buzzed-about new artist named Ramiro Gomez, whose artwork includes exactingly executed depictions of mansions and the manicured hedges of the wealthy, with wraithlike and often faceless images of underpaid janitors, nannies, and garden crews waiting on the sidelines. One of Gomez’s much-publicized “guerilla” art projects involved the placing of cardboard cut outs of domestic workers at the gates of Los Angeles-area mansions. Speaking of art serving as a kind of diary, the celebrated professor emeritus of American Studies and founding UC Santa Cruz faculty member John Dizikes used poems by W.H. Auden, Henry Wadsworth Longfellow, Marianne Moore, and Langston Hughes to reflect on how learning works and also explore his development as an educator. Dizikes joined Weschler and psychology professor Steve Whittaker, literature professor Jody Greene and dance professor Edward “Ted” Warburton in his discussion about learning. In some of the presentations, returning alumni had a chance to hear the stories of successful Slugs whose UC Santa Cruz roots informed some of their life choices and even their business practices. 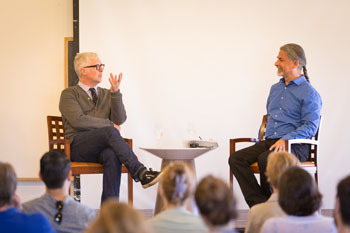 One dramatic example is Blue Bottle Coffee founder James Freeman (Stevenson '90, philosophy) who had an informal but eye-opening talk with UCSC philosophy chair and associate professor Daniel Guevara. Freeman’s talk was all about following your passion. Two other True Original presenters, the computer game designers Akira Thompson (M.S. 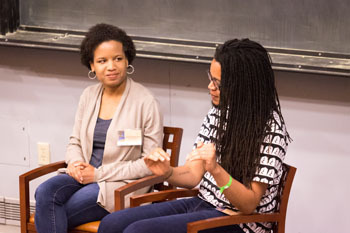 ’15, games and playable media) and Lauren Scott (Porter ‘14, business management economics/computer science) also shared stories about pursuing their visions. Thompson helms his own independent game company and has been drawing attention for &maybetheywontkillyou, a live game in which the player takes on the role of a poor black American attempting to go to the corner store down the street and return home safely without getting harassed or even killed by police. Lauren Scott, who appeared alongside Thompson, is part of the new wave of button-pushing female video game designers. After graduating from UC Santa Cruz, she went to work at Zynga as an associate game designer. After a year there, she went to work at Hangar 13, a 2K Games studio, where she is working on Mafia 3, a “third-person shooter” game with an organized crime theme.